plan for how the city will cope with the changes climate change is bringing. For many years these efforts appeared to go nowhere. still there was no public sense, nor any sense through private conversations with city staff or supportive councillors, that there was political will to take action on climate change. Finally in early 2013 there was a breakthrough. 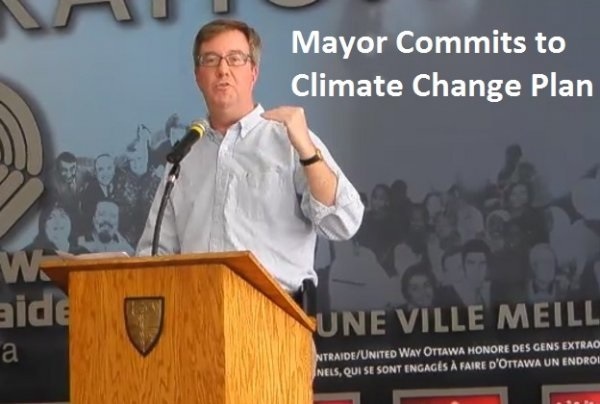 At the March 23 GHG Roundtable Mayor Jim Watson assumed a prominent role and vowed that the city would renew its Air Quality and Climate Change Management Plan by mid-2014. Also, have you signed the Ottawa Climate Pledge? *GHG is shorthand for “greenhouse gas” – those emissions such as carbon dioxide (also known as CO2) and methane which, as their concentrations increase, are responsible for trapping more heat in earth’s atmosphere. A number of cities have officially adopted meatless Monday, including requiring city cafeterias and schools to provide plant-based options. Baltimore, Los Angelas, Aspen, San Fransisco, Miami, and even the mayor of a small town in Texas has adopted Meatfree Mondays. Sadly, in this day and age, one can no longer be an environmentalist without reflecting on the food one eats. However, it is often overlooked by environmentalists, as it was by me for many years.